Directions:Follow Preston Road (289) Approx 10 miles North of HWY 380 to County Road 134 and turn Right (East). Go approximately 1 mile to County Road 97 and turn Right (South). Turn Right on Green Valley Way. Model homes are on your right. Listing provided courtesy of Derek Phelps, Jeanette Anderson Real Estate. SchoolsClick map icons below to view information for schools near 2944 Open Range Drive Celina, TX 75009. Home for sale at 2944 Open Range Drive Celina, TX 75009. 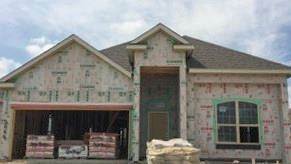 Description: The home at 2944 Open Range Drive Celina, TX 75009 with the MLS Number 14021010 is currently listed at $289,860 and has been on the Celina market for 71 days. You are viewing the MLS property details of the home for sale at 2944 Open Range Drive Celina, TX 75009, which includes 4 bedrooms, 2 bathrooms and has approximately 2014 sq.ft. of living area.